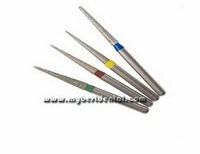 Name: Ski High Speed Diamond Burs Color Coding Color code indication is provided at the end of working part', according to the size of diamond grit conforming to the I. S. O. Specification. Classification Ski Coding system reflects shapes of burs. The contour and sizes could be imagined by nomenclature since I. S. O. Numbers are also indicated. Specification TF/Taper Flat End TR/Taper Round End TC/Taper Conical End FO/Flame Ogival End SF/Straight Flat End SO/Straight Ogival End SR/Straight Tound End RS/Rounded Shoulder EX/Special(Extra)shape BR/Ball Round Type BC/Ball Collar Type DI/Double Inverted Cone S/Short Shank SS/Super Short Shand C/Coares F/Fine EF/Extra Fine SI/Single Inverted Cone WR/Wheel Round Edge CR/CR Inaly Preparation Dia-Burs CD-Children's Dentistry Dia-Burs High Quality Control 100percent inspection with laser measurement machine, cutting test and strength test for each lot are performed. All products comply with our own standards which are far more strict than I. S. O. Standards.